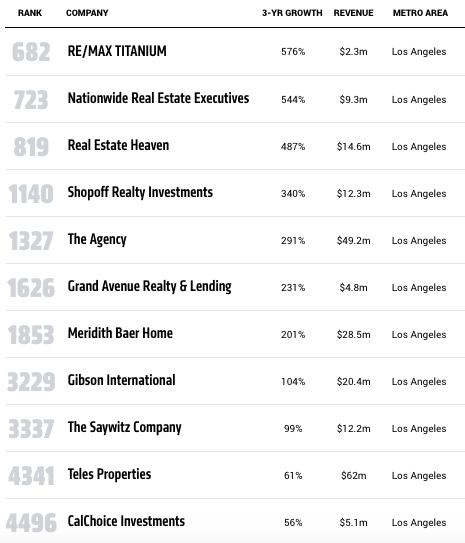 Rising stars in real estate are recognized in a variety of outlets, but making it on the Inc. 5000 list of fastest growing private companies signifies standing out among all industries. Inc. magazine ranks the 5,000 fastest growing private, independent companies in the country every year, basing its list on percentage revenue growth over a three-year period. Past honorees of the Inc. 5000 include LinkedIn, Yelp and some company named Zillow — not the worst group to be included with. To qualify, a company’s revenue in its initial year must have been at least $100,000 to make the list, and revenue in the most recent year must have been at least $2 million. Subsidiaries or divisions of other companies were not considered.